The Easter eggs represent the beginning of a new life. This was symbolic of the advent of Spring which brought with it a new life for flora and fauna. Easter eggs were first colored by the pagans to resemble the rising sun and announce the return of light. The northern lights were also painted on the Easter eggs. In Medieval Europe, eggs were forbidden during Lent. Eggs laid during that time were often boiled or otherwise preserved (pickled eggs anyone?) Eggs were prized Easter gifts for children and servants; I am sure because eggs were plentiful after Lent they could be given out to servants as “gifts of food”. Rabbits and chicks represent the rebirth of Earth. Spring is a time when the Earth is literally reborn. Barren fields become lush green, trees get new foliage and flowers and fruits abound. The Easter bunny is definitely the most beloved symbol of Easter and extremely popular with children. History indicates that it may have been the hare and not the rabbit that was associated with Easter. The hare is legendary because it is believed to never close its eyes – not even to blink. Rabbits on the other hand are born blind. Hares were thought to be staring at the full moon all through the night. The hare was also a symbol of fertility linked to the Greek goddess of fertility Eostre. However, rabbits are more fertile than hare and far more prolific reproducers, and far cuter. 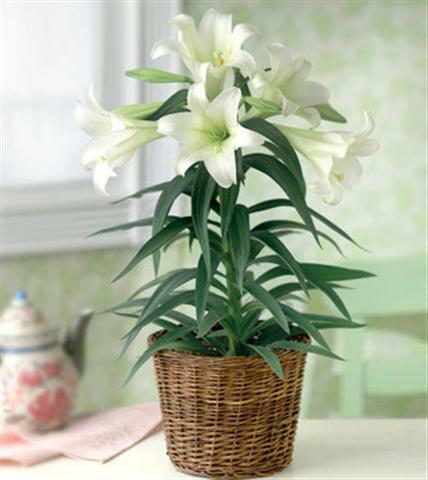 The white lily is thought to be pure as Christ and a symbol of the purity of the new life that comes from being resurrected. Here in the West we call these peace Lilies because, let’s be honest, the name Jesus Lily would only sell to a certain marketshare. Early Spring is a time of renewal and is scared to almost all religions. I love this time of year because it is time of renewal and new hope. Spring fever has hit, and though we have more snow on the way I am ready for change. I am taking this time to clean out my closets and purchase new herbs. My closets will be thinned while my garden beds will be full of edible goodies; at least I hope so, the snow may hamper my dream. Whatever holiday you are celebrating I want to wish you all the very best. Thank you to the History Channel and Monster.com for the source. Sari…that was a beautiful post. I love Easter lilies, but they are fatal to cats and we have one that loves to eat plants (think he is part goat).Have a great week. Hi Diane, Happy Easter and Passover. Thanks for the tip about the plant. I had forgotten this.My cat eats my bamboo. She will not touch any other plant, just likes to snack on the bamboo in the morning. Cats can be so weird!